Since Pokemon: Let's Go, Pikachu is, in more ways than one, a revamped remake of Pokemon Yellow, it was expected that a number of core aspects of the original game would continue to be in place. In one of the issues of Coro Coro Magezine leading up to the release of Pokemon: Let's Go, Pikachu, it was revealed that Lt. Surge will make his return as the Vermilion City Gym Leader in said game. 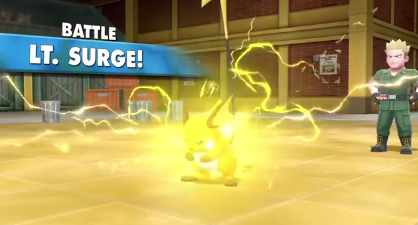 It has yet to be revealed what Pokemon (and at which Levels / Combat Power) Lt. Surge will own in Pokemon: Let's Go, Pikachu, outside, of course, his trusty Raichu. There is a chance this will be Lt. Surge's only Pokemon since that is how things were back in Pokemon Yellow, but there is also a chance he will carry a Voltorb and a Pikachu like back in Pokemon Red and Pokemon Blue.